Ashley Armijo at the Rotary of Santa Fe acceptance lunch. The New Mexico Center for Therapeutic Riding has been awarded $1000 from the Rotary of Santa Fe Good News Grant. 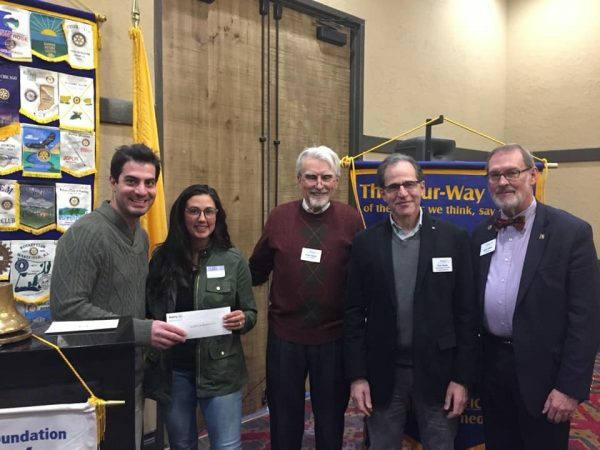 Each regularly scheduled meeting, Rotary Club of Santa Fe takes a collection of donations from the members to be able to support non-profit organizations. NMCTR along with five other non-profit organizations were selected to receive funding in 2018-2019 year. NMCTR’s Director, Ashley Armijo, attended a Rotary Club of Santa Fe lunch meeting and accepted the $1000 check on behalf of NMCTR. The grant monies will be used to purchase props/instructional material to use for the children in NMCTR’s School Outreach Program. The props/instructional materials will assist in the interactive learning for children with special needs given through equine assisted learning. Thank you, Rotary Club of Santa Fe, for the continued support of NMCTR’s mission!